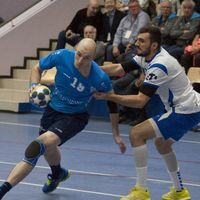 After Dicken qualified for their very first European quarter-final last weekend, 14 teams are fighting to join the Finnish team, as the second weekend of the Men’s Challenge Cup Last 16 takes place this weekend. Norway’s only remaining representative in the men’s European Cup competitions, ØIF Arendal are in a relatively good position to take a step further in the competition. The team from Southern Norway won the first leg of their Last 16 tie against Dynamo-Victor 27:21, much to the joy of the 1,276 spectators who were particularly happy about the 12 goals from left wing Andre Lindboe. With the six-goal win at home, Arendal have given themselves a good chance before the long trip to Stavropol in Russia for the return match on Saturday afternoon. The first of the remaining quarter-finalists will be found as early as Friday evening and it looks likely to be HC Neva SPb. Before the home game in St. Petersburg, the Russian team are leading by 10 goals against MSK Povazska Bystrica after winning the first leg in Slovakia 31:21. While the women of CSM Bucuresti are already certain of progression to the quarter-finals of the Women’s EHF Champions League, the men from the Romanian club are very close to doing the same in the Challenge Cup. When CSM welcome HC Dukla Praha in the Romanian capital on Saturday afternoon, they will have a five-goal lead with them from the first match. CSM won 28:23 in the Czech capital, making them obvious favourites to reach the next stage. A somewhat closer encounter may be expected in Vise, Belgium, but the home team appear as favourites here as well. HC Vise BM defend a one-goal lead from their away game against HC Masheka, whom Vise defeated 32:31 in Belarus last Sunday. On that occasion, 10 goals from centre back Siarhei Mikhalchuk were not enough for a Masheka win, but the Vise defence will need to keep an eye on him in the return fixture. This weekend will also see a double-header determine one of the last quarter-finalists. It takes place in Funchal on the Portuguese islands of Madeira, where AM Madeira Andebol SAD host two matches against Donbas from Ukraine. While Madeira will be trying to emulate their semi-final berth from last season, Donbas are celebrating their comeback to European Cup handball after a 10-year absence. So far, the Ukrainian club’s finest achievement was reaching the group phase of the EHF Champions League in the 2002/03 season.